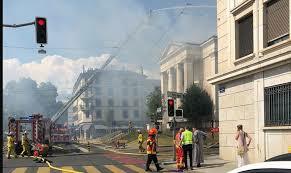 The Catholic church "Sacré Coeur" in Geneva was in flames on Thursday. The flames rose very high as the fire continued for about 3 hours. The Catholic church "Sacré Coeur" in Geneva was home to a Spanish speaking community. There were no casualties. The fire burned at the Sacré-Coeur Church in Plainpalais, destroying the attic and severely damaging the nave of the iconic 1859 landmark of the city centre. Over 50 firefighters in 23 emergency vehicles battled the blaze in extremely high temperatures until 18:45 when the fire was finally declared under control. The upper floors was a community centre where courses were also given. Other community events held there include the twice annual International Children’s Clothing Sale. The police said the interior of the Church is completely destroyed and the cause is unknown.